Many of you use PMs to communicate with each other (and your humble moderators) which is highly encouraged for discussions that are inappropriate for public/board discussions. Note, that if you look at your inbox and see that you are close to your total message count, you should clean things up a bit. 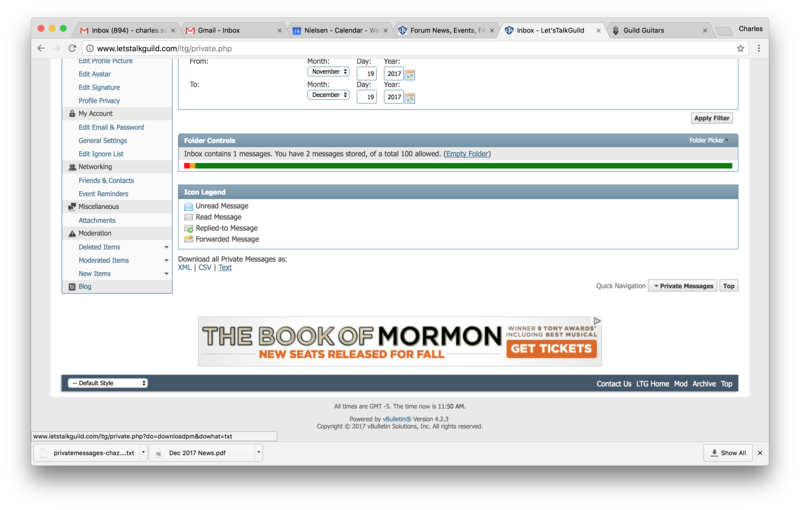 The site allows you to save your messages (both inbox and sent messages) with a single click. If you go down to the bottom of the inbox page, you'll see that "Download all Private Messages" section and you can choose what method you like. I save everything as text (see below). When completed, you need to delete your inbox messages and delete your sent messages if you want to clear things out. I'm not sure if there's a single button for that. What I usually do is click on the top button that highlights all the messages in the inbox and then do the pulldown at the bottom that offers delete. I do the same in the "sent" messages, which you can navigate to on the left. (maybe someone can post some pictures of that part of the instructions). I'm pinning this and will happily edit the thread if anyone has any further instructions to add. TIA.